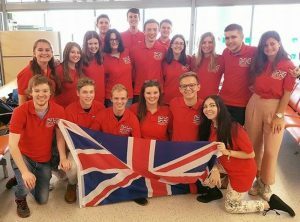 Josh Curtis, Enactus International Director, reports on Enactus Nottingham’s success at this year’s Enactus World Cup. The Enactus World Cup is an event unlike any other. This year, student, business, and world leaders came together in Toronto, Canada in celebration of a shared commitment to using entrepreneurial action to create a better, more sustainable world for all. Our Enactus Nottingham team got to be a part of this thanks to being crowned Enactus UK National Champions in April out of the 55 competing British teams. This meant we travelled to Canada in September to represent the UK, presenting our work in social enterprise over the past year, alongside respective champions from 35 other Enactus countries. Presenting our two flagship businesses, Re-Covered and Aquor, we managed to fly through the first round of competition and into the Semi-Finals, equalling Enactus Nottingham’s best performance at a World Cup. Competing against an incredibly inspiring Enactus Nigeria team, our presentation team journey finished in the Semis. This meant that we could sit back and enjoy the Final Stage of the competition with all pressure off, with the pride of being a top 16 Enactus Team worldwide! The World Cup is so much more than just a competition; it is all about celebration and collaboration. From listening to Nelson Mandela’s granddaughter, Swati Dlamini, give a keynote speech, to participating in UN Sustainable Development Goals Ideation Sessions, our 30-person strong team of travelling students, advisors and alumni got to meet and engage with students and business leaders from Australia to Azerbaijan. Through discussing world income inequality with Walmart’s Head of Sustainability, to getting a hug from Ben & Jerry’s very own Jerry, every member of our team had a real once-in-a-lifetime experience. Seeing host nation Canada close the event with a truly inspiring and competition-winning presentation, topped off a wonderful 3 days. We have returned with great memories, and an even greater passion for having a sustainable impact on the world. And while we now focus again on our projects, we keep one eye on next year’s World Cup… as hosts, in London. Good luck guys! Well done!